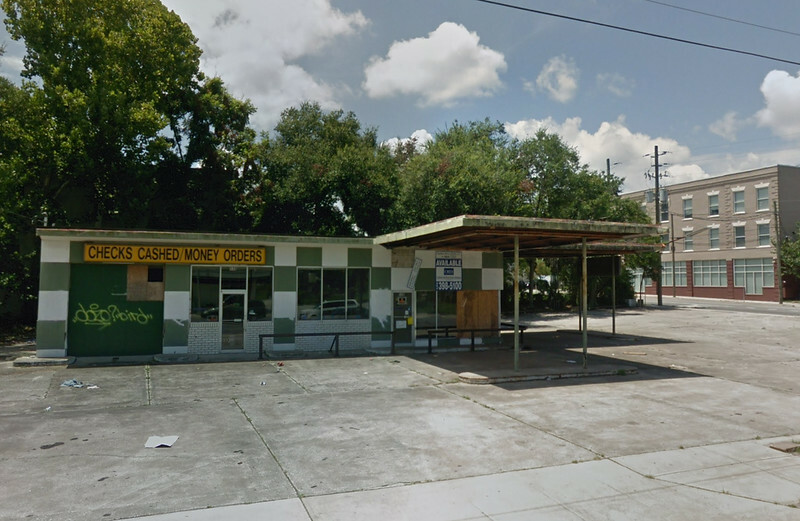 Plans have materialized for the redevelopment of a blighted property situated at a major intersection in LaVilla. On Thursday, April 11th, the Downtown Development Review Board (DDBB) will review a plan for the construction of a small retail center at the southeast corner of West Union and Broad streets in LaVilla. An application requesting conceptual review approval was submitted to the DDRB by Landscape Architect Joe Loretta of Genesis Halff for the redevelopment of 530 West Union Street. According to the application, Loretta is acting as the agent for 530 Union Street LLC. to obtain DDRB approval for the development of the property. Preliminary design plans by Nick Renard of Dig Architecture indicate adding on to a 1,656 square foot building, previously occupied by a check cashing store, to create a 2,956 square foot retail center. Previously occupied by a check cashing store, the existing building was originally constructed as a gas station in 1963. The gas station’s former pump areas and concrete apron would be redesigned to accommodate a small off-street nine-space parking lot since on-street parking is not present on Union or Broad streets. As such, the building will not conform to design criteria calling for limited building setbacks. (1) A knee wall with faux wrought iron style fencing be constructed along Union Street, similar to the one to the site’s east. Further, the knee wall and faux wrought iron fencing should be extended along the site’s Broad Street frontage as well. The existing sidewalk widths are not to be reduced. (2) The applicant provide perimeter landscaping along its west (Broad Street) side that meets the minimum landscaping requirements; the applicant provide an alternative landscape plan, subject to DDRB approval. (3) The applicant provide an alternative landscape plan for the site’s north (Union Street) frontage that incorporates shade trees, recognizing that a previous recommendation by staff for a knee wall may hinder an ability of the applicant to meet landscaping requirements. (4) Should minimum landscaping requirements along the site’s eastern boundary no be met, the applicant will provide an alternative landscaping plan for DDRB approval. (5) The dumpster is to be screened and enclosed so as to not be visible from a right-of-way or an adjoining property. The project is further evidence of an significant retail scene beginning to emerge in LaVilla and Brooklyn since the 2015 opening of Brooklyn Station. Other projects including retail space under construction or proposed in the area include a food hall on Park Street, 14,000 square feet of ground floor retail space in the 10-story Vista Brooklyn project, a multi-tenant project anchored by Chipotle Mexican Grill and Panera Bread called Brooklyn Place, and a mixed-use adaptive reuse project on West Forsyth Street.